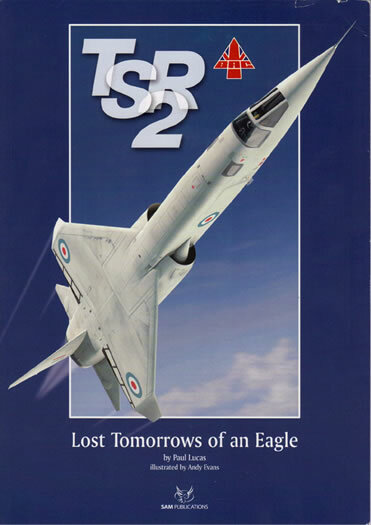 TSR 2 Lost Tomorrows of an Eagle by Paul Lucas Published by SAM Publications. Well researched from many source documents. 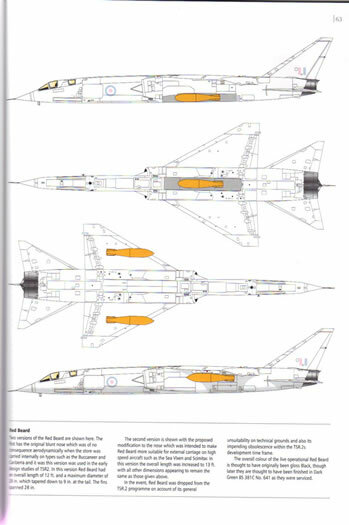 Logically steps through the planned employment of the TSR2. Assessments and deductions based on files and contemporary experience. Extremely useful both as a history of the TSR2 and an examination of what may have been. Useful for the detail it offers the modeller both if building an accurate prototype or taking one the available kits and applying so what if based on fact. The TSR2 is first and foremost a controversial aircraft. Even as I write this review there are a number of discussions raging on various websites regarding the merits of the aircraft and the circumstances of the cancellation when it is long believed to have been on the verge of success. 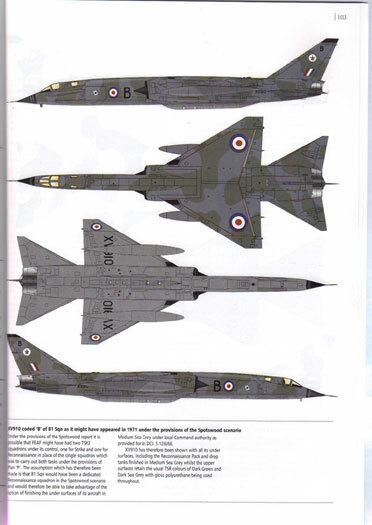 Given only one airframe eventually flew, with a second narrowly missing out on entering the test program by the sudden termination of the program, it is unsurprising that, with some very nice models available from Dynavector and latterly Airfix in the popular scales of 1/72 and 1/48, it is a popular subject for what if modellers. To whit SAM Publications has produce this rather lovely volume “Lost Tomorrows of an Eagle” the collation and updating of a long series of articles originally written by Paul Lucas and published throughout 2006 in Model Aircraft Monthly magazine. In this book Lucas provides a detailed and extensively researched examination of surviving documents and records to provide a glimpse of what might have been if the combination of strategic policy, cost overruns, poor project management and the dire economic circumstances then prevalent in the UK had all come together to see the program ended in April 1965. Given the myths that have grown up around the cancellation, Lucas helpfully opens his book with an examination of Policy, Planning and Prototype which looks at the airframes as delivered as well as the political, military and other policies that impacted on its ultimate fate. He then steps through different aspects of the TSR2 as it may have been employed. Chapter 2 looks at the first planned use as a deterrent in 1960, followed by Chapter 3 when it was reconsidered as a stop-gap deterrent in 1963 as an strategic gap appeared to be emerging between retirement of the V Bomber fleet and deployment of Polaris submarines. Having stepped through these policy machinations, Chapters 4-7 examine initial deployment of the capability and each of the proposed roles of the TSR2 in some detail, these being the nuclear strike role, the conventional strike role and the reconnaissance role Finally Chapter 8 looks as the development of EW countermeasures systems proposed for or developed with the TSR2 in mind. Finally a short postscript examines the potential design studies related to a variable geometry wing version. Each of the chapters is supported with clear colour photos, reproductions of applicable documents and illustrations in the form of profiles and drawings to illustrate the development of proposed camouflage schemes, Squadron markings and potential weapons fits. If a modeller really wanted to ground their what if TSR2 on a sound counter-factual basis then some of illustrations will form an excellent reference. I am a big fan of the TSR2 and even though I have the original Model Aircraft Monthly issues from a few years ago I still find it nice to have them in one compact volume rather than as a number of magazine issues. The TSR2 has always been a favourite aircraft of mine since I first saw one of the surviving airframes at Duxford and subsequently its sister at Cosford. The potential connection to the RAAF (see RAAF Pathfinder No 72) has further heightened my interest and I have an Airfix 1/48 scale kit laid down especially to build an example as flown by 1 Squadron RAAF. In summary, Lucas has done an excellent job sifting through surviving documents, addressing some myths and illustrating others. That, along with photographs of surviving examples, all combines to produce a volume that will appeal to aviation enthusiasts and modellers alike. Thanks to SAM Publications for the sample.